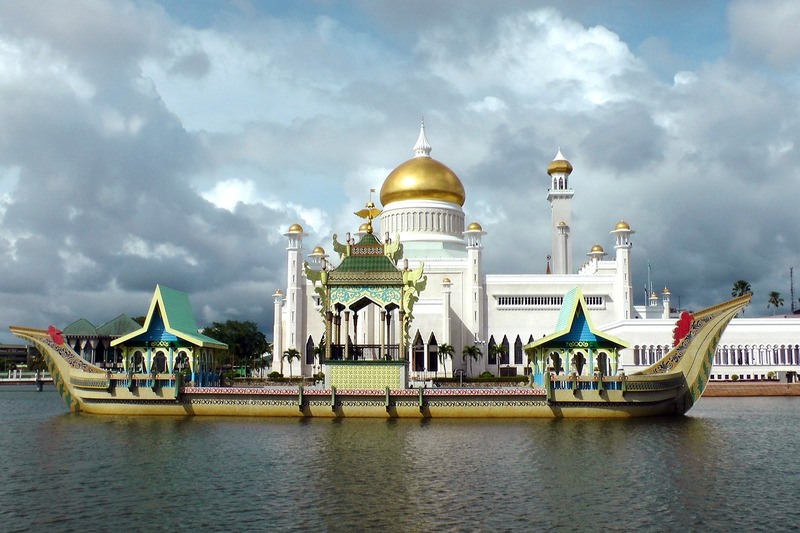 Brunei is a small Muslim sultanate-state on the island of Borneo in the South China Sea, bordered by Malaysia. Its area is about 6,000 square meters, and the population is just over 400,000 people. Brunei is visited by about a million tourists a year, mainly from Malaysia, China and Singapore. Tourism in Brunei is quite a new sphere of the economy. Strict rules, established in the state regarding the prohibition of alcohol, do not provide intensive development of this industry. Nevertheless, Brunei took a course to improve the tourism infrastructure and hotel business. Comfortable hotels appeared in resort areas, tourist routes were arranged, beaches were equipped and luxurious restaurants were built. The main places to visit include the capital Bandar Seri Begawan, where are the Sultan Palace, museums, the mosque of Omar Ali, which has a long history. Also there are 28 villages standing on stilts in the water, Kampung Ayer and Natural Park "Jerudong Park" in Tutong. Ecotourism is represented by the tropical jungle in Temburong National Park. Most tourists prefer to combine sightseeing with a beach holiday. In Brunei there are 15 beaches, characterized by clean sand and clear water, in some places they are surrounded by mangrove forests. The beaches in Brunei are very beautiful, but infrastructure is underdeveloped, there are many completely wild beaches. One of the best beaches in the country is Jerudong Beach, located near the capital, provides excellent opportunities of recreation. In Brunei, five-star and four-star hotels on all inclusive bases dominate. The pride of the country is the hotel "Empire", the construction of which took more than 2 billion dollars. However, here you can find economy class hotels, where there is an acceptable level of comfort. There are no direct flights to Brunei, so airlines offer various options. The most economical and fast flight is with a change in Bangkok or in Malaysia. From there you can get regular flights to Brunei. Going to Brunei, it is necessary to take into account that local people live in accordance with the harsh laws of Sharia, and this determines all sorts of prohibitions and restrictions. For example, there is a ban on drinking alcohol. There are no discos and nightclubs, working until the morning. However, this has its advantages. Today Brunei remains one of the safest countries in the world, and tourists do not need to worry about their lives or the safety of their personal belongings. Tours to Brunei are usually bought by Russian tourists as part of tours to several neighboring countries - Malaysia, Indonesia, and Singapore. They are offered mainly by tour operators specializing in Southeast Asian countries or individual tourism: Oriental Discovery Group, Art Tour, Karlson Tourism, MIRACLE, Colors of the World, Antiktravel, Jetlane Travel, Quinta Tour. According to the announcement at Asian Tourism Forum in Vietnam, Brunei will host the leading travel event 2020.